Countries often like to tell their history as if it involves a pure line of descendance from some prized ancestral group. Nos ancêtres les Gaulois (our ancestors the Gauls) is how French history books used to begin, even the history books used in African colonies. Such a story of pure origins typically covers over the more mottled, mixed and blended conjuntion of peoples and events that really shaped a country. Lately, we have come to realize that much of what France prizes as part of its heritage has Italian roots. Take perfume. The city of Grasse, not far from Nice, was once the perfume capital of the world. On a visit there we learned that the town was originally a center for tanning, where hides were transformed into leather. One problem: the leather, given its source, was often accompanied by an unpleasant odor. Then came the Italian connection. Caterina Maria Romula di Lorenzo de’ Medici was her name. She is better known as Catherine de Medici, wife of French king Henry II. She may have brought the practice of scenting leather with oils distilled from flowers. At least that is how one version tells it. The other version has someone in Grasse come up with the idea of perfuming gloves and then presenting a pair to Caterina/Catherine. Once she adopted the practice, it became all the rage, and the French perfume industry took off. Caterina also played a key role in another area in which the French take pride, gastronomy. Leaving cultured Florence for Paris was kind of a bummer for a good looking, wealthy, well-connected young woman. Not wanting to suffer too much in her exile, she brought chefs with her to Paris. The Italian Renaissance, in one of its dimensions, had transformed cooking to new levels of refinement. It will come as no surprise that Avignon, the nearest big city to our village, owes much of its historical success and architecture to Italians. Exactly 700 years ago the first pope arrived to set down new roots. Having a pope around meant that rich and powerful (Italian) cardinals would soon be arriving, injecting wealth, economic prosperity and architectural novelties into the area. More surprising was what we learned on a visit to Lyon last week. 16th century Lyon was a thriving place. Why? Italians of course. Italian merchants and traders made of it an international business center famous for its commercial fairs. A lesser known city that is a favorite of ours is the Mediterranean port of Sète. The city is dominated by a mountain in the center, criss-crossed with canals, and bordered by a lovely beach. As a working port it has not yet been transformed totally into a tourist enclave. Its earlier name Cetia indicates the area’s Italian heritage. The city’s local gustatory specialty is called a tielle. Typically when we hear “local specialty” we run the other way. Local specialities stay local because their tastes do not travel well. The tielle is an exception. It’s kind of a pot pie, made with octopus. A key ingredient, here comes the Italian influence, is tomato sauce. Really, it is good, a lot better than I am making it sound. 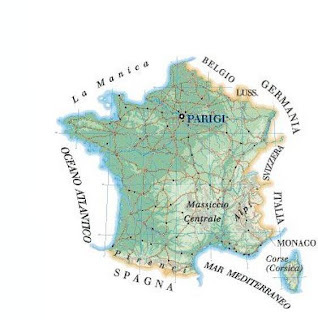 Several key personalities in France also were initially Italian. In the late 60s a singer and movie actor sort symbolized French artists who combined their talents with political activism. His name was Ivo Livi. He gained fame as Yves Montand. Today, the French first lady is Italian-born Carla Bruni. Most prominent of all is an individual known everywhere. He came to life as the child of parents named Carlo and Letizia. He had an older brother named Giuseppe. His birth name: Napoleone di Buonaparte.